Welcome to MyPartyGames.com. Everyone loves playing games on parties but I have realized that most of the website only offer ideas for Party games. Printable games are available but such games are very expensive most of the time. So I decided to make this website with high-quality graphics and to provide Free Printable Party Games that you can print using your home printer. These games will fill your party with fun and laughter. I am adding one or two new games to this website every day. I have made free printable party games for Christmas, Halloween Party, Baby Shower, Birthday, Wedding Shower and Bridal Shower, Family reunions and get-togethers and Free Printable Games for Kids party. There are easy to follow ‘how to play’ instructions with each of the game but you can also use these game cards to play the games with your own creative variations. Print these games one or two days prior to your party. Keep the number of guests in mind and print one or two extra game cards. Prepare gifts and prizes for the guests in advance. I’ll soon add a post to give you ideas about these gifts and prizes. Get clipboards for each guest so they can play these printed games easily. Keep sufficient supply of pens and pencils according to the number of your party guests. You can print these games on card stock paper or even on ordinary printer paper. These games will be more fun to play in color but a black and white print out will also do well. I hope my games will help in making your parties memorable and full of fun. and many more fun and free printable party games that are suitable for both kids and adults. 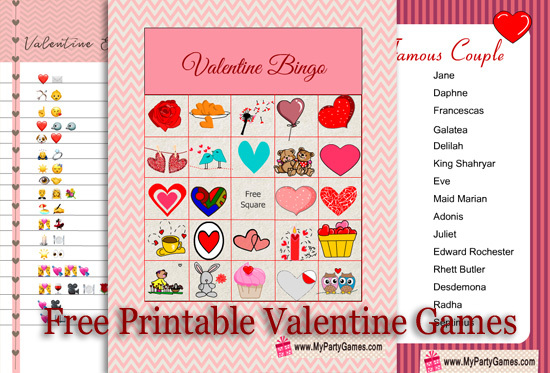 I have made 14 cute free printable Valentine’s Day games that I have added to this website. You can also download photo booth props for Valentine’s day from my website. A collection of cute and fun-filled Christmas games that can be played by the whole family. 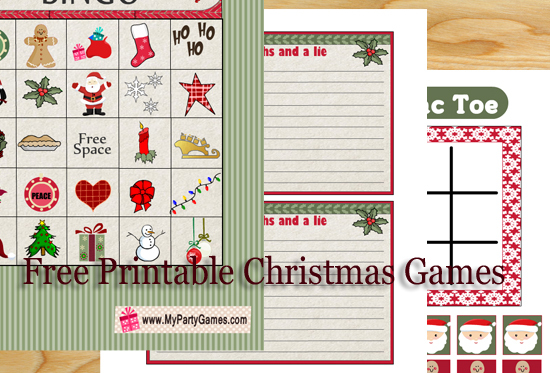 You can enjoy the Holiday family re-union and add a lot of fun to the celebration with my free printable Christmas games. 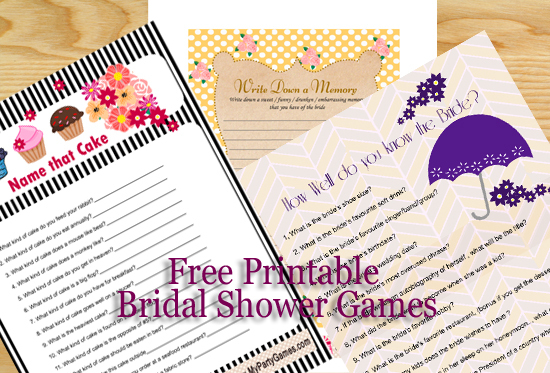 There are fun games with pretty graphics to make your wedding shower, bridal shower, hens party or bachelorette party memorable. You will get cute games to play with your guests that will also serve as keepsakes for mom-to-be. These games will make your Baby Shower event colorful and cheerful. 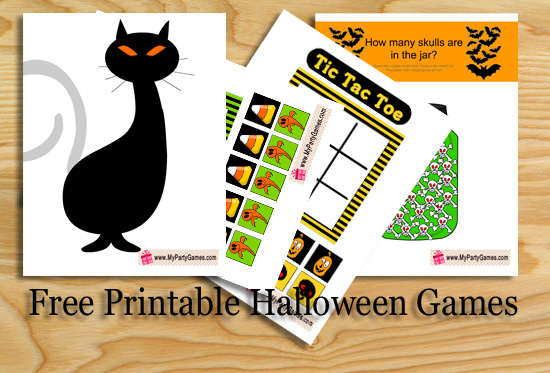 On MyPartyGames you fill find Free printable Halloween games for every age group. You can play these games in classrooms, homes, with your family and also with your friends. 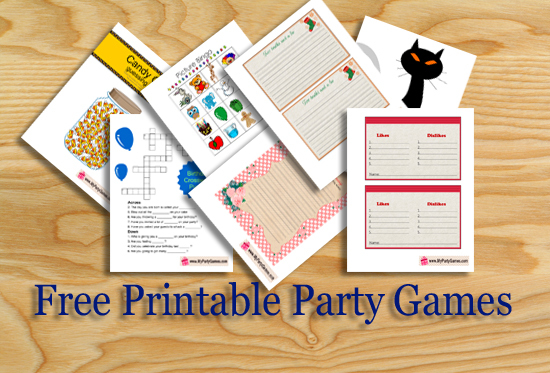 A collection of adorable free printable games for Birthday Parties. All these games can be enjoyed by both kids and adults. I have also made cute games for Kids. These games can be played in classrooms, homes or any get-together that involves kids. I have also made free Printable Family games. These games can be played on family reunions, get-togethers and whenever family members want to have some fun.